So! Who plays Wonder Woman ??? New NBC president Bob Greenblatt must see something he likes because he has ordered a pilot for David E. Kelley's "Wonder Woman" reboot. Originally passed by NBC because the network couldn't commit to the type of license fee that the studio was seeking in order to do the show Kelley had envisioned. Now with Greenblatt in charge, he is trying to take things in a new direction and wants Kelley to bring one of the most promising new series for NBC this season. The project is described as a reinvention of the iconic D.C. comic in which Wonder Woman -- aka Diana Prince -- is a vigilante crime fighter in L.A. but also a successful corporate executive and a modern woman trying to balance all of the elements of her extraordinary life. Re: So! Who plays Wonder Woman ??? awesome news, Wonder Woman really needs some representation in the mass media, as part of the DC trinity (Superman,Batman,Wonder Woman) she surely gets the short end of the stick when it comes to movies, cartoons, tv shows and even comics. That plot sounds pretty similar to the current Power Girl series (which is awesome), I hope they really go all out when it comes to the mythological side of her though! I'm dubious about a new Wonder Woman series, especially given NBC's attempts at the Bionic Woman remake, but I'm still hopeful that it will be an enjoyable TV series that will last at least a full season. 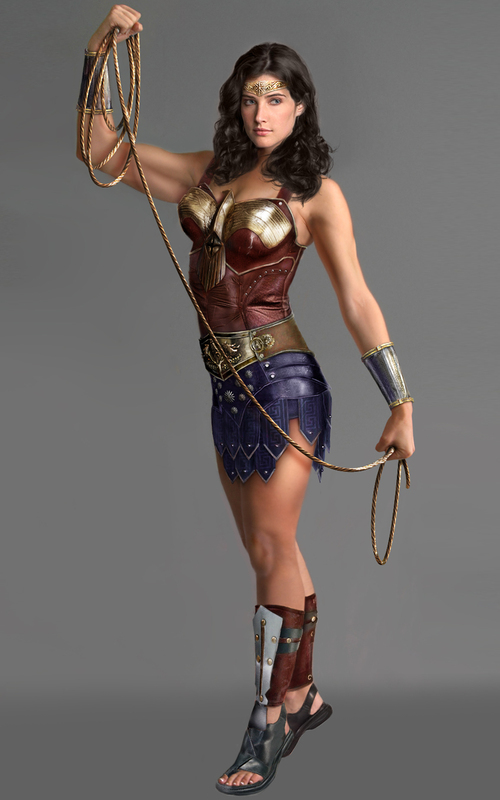 As for who should play Wonder Woman. I'd like to see Bridget Regan (Kahlan from Legend of the Seeker) cast in the role, but she's recently had her first child, so the demands of the lead in a network TV series may be too much. Alternatively, I'd also like to see Alexa Davalos (Gwen on Angel; Andromeda in the Clash of the Titans remake) as Wonder Woman, although she may be concentrating on her film career at the moment. How about Robin from "How I met your Mother"? I really enjoyed the animated movie from the last year or so. I thought the Linda Carter series was cool too. sorry.....I kinda zoned out there for an hour 'reading' the last post. I'm with you, Nitey, great great suggestion (almost a shame though that HIMYM will keep her from being a part of the show). mse6 wrote: sorry.....I kinda zoned out there for an hour 'reading' the last post. Would love to be at the auditions...."Ok, so can you wear this bikini and run towads me several times. Thanks"
Since Kelley loves recycling actors, I certainly wouldn't mind if Rhona Mitra ended up with the role. Her last TV series was cancelled, so I think she'd be free to head-line a new TV series. I'm not so keen on Kelley using Lake Bell for Wonder Woman though. And thank goodness he's already cast Kathy Bates on Harry's Law (which was meant to be David Tennant's "big break" in the US) otherwise we might be seeing her running around in a one-piece swimsuit. Monica Bellucci would have been my choice a couple years back. David Tennant was never cast in Harry's Law, originally it was commedian/columnist/media personality & commentator Lewis Black that was cast before changes were made. You're confusing it with the pilot to another legal 'dramedy', Rex is Not Your Lawyer, which is the show Tennant signed on for, and which was ultimately not picked up for series. Like Harry's Law, it was also made for NBC, but Kelley had nothing to do with it, and it was passed over at pilot stage. Hopefully she can act as good as she looks in that costume!! That's one hell of an outfit! It's whorrific! Emphasis on "whore". It's not a bad design, but the materials chosen for the corset and the pants and for the "metal" elements like the breastplate, belt and bracelets are terrible. Also, it needs shoulder-straps and flat heels. It's supposed to be an action show and I just don't see the actress or the stunt-doubles comfortably being able to run, jump, punch and kick in that costume. Shoulder-straps may also help the unfortunate case of "shoulder-breasts" that Wonder Woman appears to be suffering from where her breasts inexplicably grow from her shoulders instead of her chest. sha-wing! loving the costume here, although would look better with red boots to balance it out, there is a lot of blue happening there! No hot pants ... no dice. I hate it, the head band makes her look like she wants to join the sailor moon cosplayers at comic con and the amount of makeup is way too much and way too much blue. how about this image...found on the WWW. I'm a BIG fan of the above fan-design. I think it's by an Aussie Wonder Woman fan. The only thing I don't like is the open-toed sandals. I wouldn't mind them for an origin film, but I think once in "man's land", Wonder Woman would switch to more "regular" boots.